I knew that travelling to Fair Isle by public transport wasn’t going to be easy. After my last A Level exam on Thursday, I caught the train up to Aberdeen on Friday morning, which took 7 hours, then the overnight ferry from Aberdeen to Lerwick, Shetland. Despite my lack of sleep on the ferry due to the excitement of visiting Shetland and Fair Isle for the first time, the crossing was fantastic. From the boat, I spotted three dolphins just after leaving Aberdeen and got splendid views of fulmars, gannets, auks and other sea birds up until 11pm. Stepping off the boat at Lerwick, in terms of climate, was like stepping back 2 months in time. A spring morning: crisp and a bit chilly. Quite different to the 30 degrees and sunshine that I’d experienced back home just a few days before. Once I’d arrived on Shetland, I had to get the bus from Lerwick to Grutness, where I was due to be getting the ferry to Fair Isle. On the bus journey, I got my first view of Shetland. I was absolutely memorised by how beautiful the scenery was. It partly reminded me of areas of the Peak District where I’ve spent hours walking, but this was contrasted with an incredible coastline and some spectacular formations. The bus journey was quite an experience, even the bus driver was a character. At the post office he pulled up, leaving the bus running, and ran in. He then returned with a bottle of Iron Brew. At the junction of my stop, he pronounced with his broad highland accent ‘Grutness’. Whilst walking down to the ferry terminal, lugging my suitcase, I paused every few metres to watch the common terns doing their thing over the water. I arrived at the terminal 40 minutes early so once I’d found the waiting ‘shed’, I dumped my luggage, grabbed my binoculars, braved winds that I hadn’t experienced since at least January, and explored the water’s edge. Immediately after stepping out of the waiting room, a Bonxie (Great Skua) flew straight over my head. Wow! This was very exciting! Skuas are one of my favourite birds and to see one that close when I’m used to watching them miles out at sea, was incredible! It wasn’t long until I’d seen a few more bonxies, along with lots of fulmars, common terns, a pair of common scoter with chicks on the sea and a few auks. It was a good job that I enjoyed the bus ride so much and a good job that I’d fallen in love with Shetland already, as the next morning I found myself back on the same bus heading for Sumburgh. After waiting at the ferry port well past the time that the boat was supposed to depart, I discovered that due to the weather, all sailing had been cancelled. Thus, I had to sort some accommodation for two nights as it was unlikely that there would be any sailing until Monday now. Although this was a bit of pain, I seized the opportunity of spending some time on Shetland for the first time. 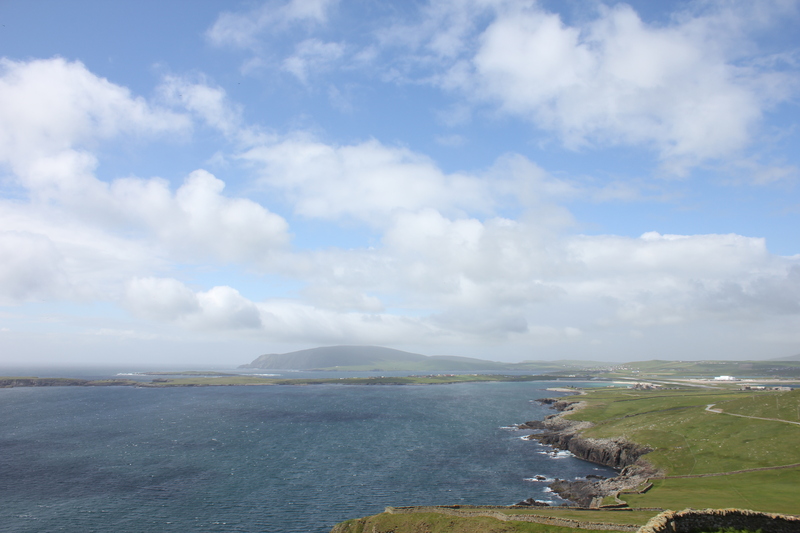 After researching the best places to visit, I concluded that since I was relying on public transport, I would visit an area known as Sumburgh Head. The area is an RSPB nature reserve at the very south of the island. On the cliffs in the area, there are breeding seabirds such as guillemots, razorbills, puffins, fulmars, along with skuas (Bonxies and Arctic) breeding on the hills nearby and the fairly regular orca sightings. The bus ride to Sumburgh was another interesting journey. This time an oystercatcher got hit by the bus! Once I arrived, since I’d missed my morning cup of tea, I headed for the café. En route, I watched an Arctic Skua mobbing common terns and observed the puffins, fulmars, cormorants and other birds on the cliff side. The view from the café was incredible. It looked over the Sumburgh area with views of lovely Shetland beyond. As I sat sipping my tea (I opted out of a slice of cake as I had a bag of jam donuts for lunch), I watched skuas and fulmars gliding past at eye level. A fantastic experience. Following this, I found myself a sheltered area along the cliff, set my scope up and did some sea watching for a few hours. I had an excellent day. I particularly enjoyed flicking from sea watching to observing those birds on the cliff side. The skuas were the highlight though. Despite there only being a few individuals about, observing them so close was fantastic! The only other place that I had seen skuas before was at Spurn. A part from the odd bird closer inland, I’m used to seeing little dots through my scope that are miles out at sea, so this was something special! However, little did I know that in 24 hours’ time I would have arrived on Fair Isle and be watching arctic skuas with chicks and on eggs. Wow.What an exciting experience.You will have fallen in love with so many places by the end of the trip. Sounds marvellous. Take lots of photos.